I wonder what number Van der Flier will get, 7.5? Good team. Great to see Beirne get a crack at the Welsh. I'm surprised Dillane isn´t back. Does Roux call the lineouts at Connacht. The Welsh will target Earls big time on Saturday. I reckon we are going to mangle em! Yes, they wont be expecting us to play four there. Joe is one smart operator. Seriously, that was what RTE had in their initial announcement. Like many others I'd have kept Larmour there too, but not what Joe would do in this sort of circumstance. Dillane might be considered unlucky, and assume it would have been Henderson instead of Roux had he been fit. 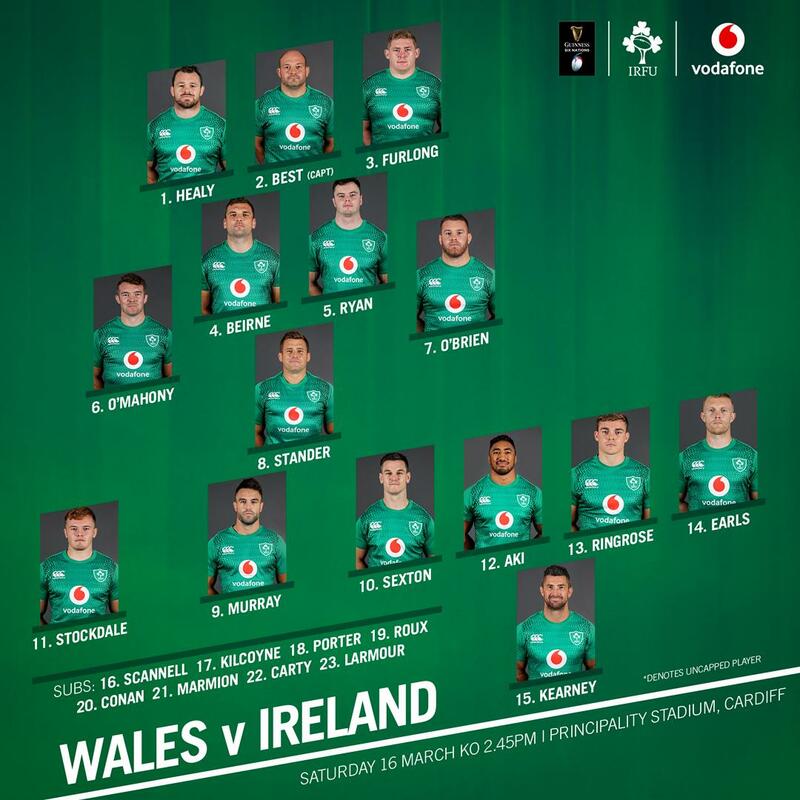 Second Row now looks like active consideration of Ryan, Henderson, Toner(? ), Dillane, Roux and Beirne. There'll be tears before Japan. Porter versus John Ryan must also have been close, as must Cooney replaced by Marmion. No Joey (not unhappy about that, hope he's resting up for Edinburgh), or Leavy- despite the multiplicity of back rows. Last edited by jagawayagain; 15th-March-2019, 07:11. 4 in the back row? Why? They’d be better off targetting Stockdale who is very suspect in defence and fielding. I’d run at him and Kearney all day, as well as raining garryowens upon them. Would have been good to give Cooney a bit more experience but Marmion is a solid option. Very glad Carty kept his spot on the bench. Really good player and very deserving. Dillane must be disappointed but I think they’re just giving all the locks a bit of time. May also be a tactical element to having a big man on the bench. Good rotation throughout the pack this 6Ns, partly due to injury, partly choice. Half backs and centres too. Only area I’d have liked to see a bit more is the back three. Conway hasn’t had much time and Larmour should be starting again this week. Might not be as positionally sound as Kearney but teams have to think twice before kicking to him. One thing I really enjoyed against France was knowing that our back three were all very dangerous off loose kicks and quick lineouts. I imagine Carbery is still nursing his hamstring, otherwise Carty wouldn't be there. SOB is due a big game if he is to keep in the reckoning for the RWC. This match may be something of a last-chance-saloon. Hope he has a blinder. Tough on Ireland's best openside, Leavy, to miss the entire 6N. Pretty good selection overall, but I still feel that Kearney's tackling against the powerful Welsh backs may not be up to it. Disappointed for John Ryan, Schmidt must think he can get away with Porter’s weakness at the scrum against Wales. A win here would be a massive statement to be fair. I do have a feeling we'll pull it off, but nothing as convincing as Twickenham last year. I'd back Beirne to make a major impression and thrive in the type of game Wales will bring. Shame Carbery is missing a chance for game time a match like this, but Carthy proving to be a very solid third option. Gatland will have Wales going full belt after our half backs, Sexton especially. Also wouldn't be surprised to see them look and target Kearney having seen how he's been shown up defensively over the past year. People talk about how Gats has been able to pick out our weakpoints down the years, but it's been Edwards more than anything. Anything we do well offensively seems to get found out by him.